N is for Not the same game. There is golf and there is golf the professionals play. The professional golfer whether on the PGA tour or playing in a tournament in Thailand on one of the Asian PGA tour stops, plays a completely different game than most Thailand golf visitors. Golfers in Thailand wonder why they don’t score like the professionals, in spite of trying to swing like them and even buying the latest “professional” model and endorsed clubs. Well there are at least four main differences between the golf the professional play and what is being practiced at most golf clubs in Thailand. 1. Golf professionals on tour use clubs that are custom built and their equipment is certainly not available in any golf shop in Thailand. Mass marketed clubs involves trade offs in length, shaft, swing weight, lie, loft, and possibly even head design as equipment manufactures have to cater to “average” build and swing types. 2. Apart from their physical ability golf professionals manage their game totally different from, for example someone on a Phuket golf vacation. For example, I meet hundreds of golfers on holiday in Thailand each year and the vast majority always shoots directly at the pin, regardless of where it is on the green, and the hazards around the green. A golf professional will usually aim for a portion of the green, and unless they are hitting it pure or have a short iron in their hands, it won’t be directly at the pin. 3. Unless you playing at a course like Alpine or Blue Canyon then you also are not playing the same courses as where professional tournaments are held. This makes comparison among score very difficult, at best, thus the need for such complicated handicap systems in use today. 4. Tournament play also involves play off the black tees, which makes a course considerably harder. 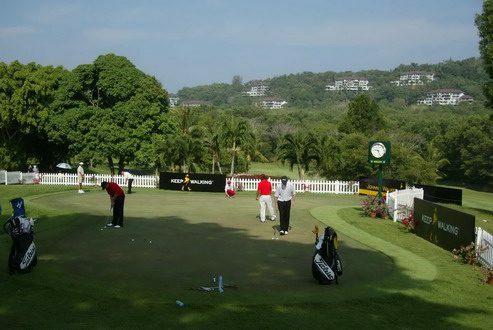 Fairways during tournaments are cut to the height of most Thailand greens, and even those at such well kept courses like Bangkok’s Muang Kaew or Chiang Mai Highlands Golf Resort can not match a course used for a PGA tournament. A friend of mine who is a scratch golfer here in Bangkok and I laughed we he heard the Thai golf professional Chapchai Nirat scored a 12 over par 84 in the final round of the 2006 Asia Volvo Masters, last December. The week following the tournament we played Thai County and he could only muster a 14 over par 86, and that was from the blue tees! The fairways were like hitting off greens, the greens were like glass, the sand was like powder, and when our balls went into the rough, it was so thick that we lucky to find it, let alone get a shot at it. The same friend had shot a two under par 70 just two weeks earlier, and it just goes to show you how much a difference course conditions can make. Anyway, the point is, that golf professionals play a different game, with different equipment, and on different courses, so comparing your game to theirs will leave you short in many areas. They practice daily, and golf is their job and business. For us who play golf as a game we should learn to enjoy it, use whatever clubs work for us, and have a clear understanding that it is NOT the same game as golf professional’s play. Now go ahead and enjoy your next round!